Are you looking for an utility knife? This here is your definitive guide to buying the best utility knives out there. Utility knives, as their name implies, have plenty of uses. While mostly used for cutting boxes (hence why some people mistake them for box cutters), they can be used for a variety of tasks around your house and on a variety of materials, such as drywall, insulation cables, foam and more. These useful blades can be found almost everywhere and can fit just about any budget, making them a must-have tool for workers and DIYers around the world. Of course, since they’re so readily available you’re bound to find utility knives varying in quality, which is why it pays to learn what differentiates an OK knife from a great one. Utility Knives Vs Box Cutters: What’s The Difference? - Box cutters are small and have a square handle, which makes them good for cutting in straight lines but little else. - Utility knives have a large, reinforced handle with a secure grip, which gives you a wider range of motion. - Box cutters are good at cutting boxes, paper and other weak materials. - Utility knives allow you to use more strength and have reinforced blades, so you can cut through materials such as carpeting, foam, drywall and even thin pieces of wood. - Box cutters are easy to drop while using and don’t offer a secure handle, as they’re meant to be affordable and convenient. - Utility knives offer a much more secure grip and often include safety functions, as they’re meant to be affordable, convenient and used in various situations. This might come as a surprise for you but utility knives can be made with different kinds of blades. This not only has an impact on their uses but also their price. You’ll see this kind of blade in two kinds of settings: The outdoors, where you need a sturdy blade that doesn’t break, since you’re bound to run out of replacements at some point. And in model making, where you need blades that allow you a lot of precision and control. As you can imagine, these blade are commonly made out of stainless steel and are sharpened only on one end. These are less durable than other kinds of blade but also more affordable, making them the to-go type of blade for most utility knives manufacturers. These blades have been specifically treated in order to add hardness to the blade, making them sharper and more durable. This treatment is only applied to the edged side of the blade, as making a blade entirely out of iron carbide would turn it brittle, completely ruining the purpose. This kind of blade has a titanium ceramic coating that makes them sharper and more durable. Unlike carbide, this treatment can be applied all over the blade, which is why you can find titanium double sided blades in the market. This kind of blade has a noticeable golden color and are almost always more affordable than iron carbide blades. Utility knives can cut through drywall, thanks to their sharpness and rigidity. Sure, this will dull the blade but that’s the beauty about utility knives. You just snap off or replace the dull blade and you have a new one! While roof shingles are notoriously hard to cut, it’s not impossible and utility knives make it downright easy. All you need to do is slice the surface of the shingle deep enough for you to bend it and snap it right off. Wood shims are the perfect thickness for utility knives to cut through and you’ll appreciate the accuracy these knives provide. Not only that but you won’t have to worry about dulling your knife and having to replace it halfway through! Utility knives are often sharp enough to cut through fiberglass insulation, though they’re rarely long enough to do the job satisfyingly. In order to get over this problem, you just need to compress the fiberglass batt by adding weight to it. This is mostly done for hinge mortises but you can use it in just about any case you need an outline. The sharp and straight edge of utility knives allows you to trace with incredible precision so simply trace carefully around what you’re planning to drill and you’ll get a perfect, or almost perfect, outline. Few knives are better than utility knives at cutting in straight lines, accurate lines and that’s why they’re so good at this job. To improve your chances at doing an outstanding job, find an utility knife with a hooked blade or replace yours. 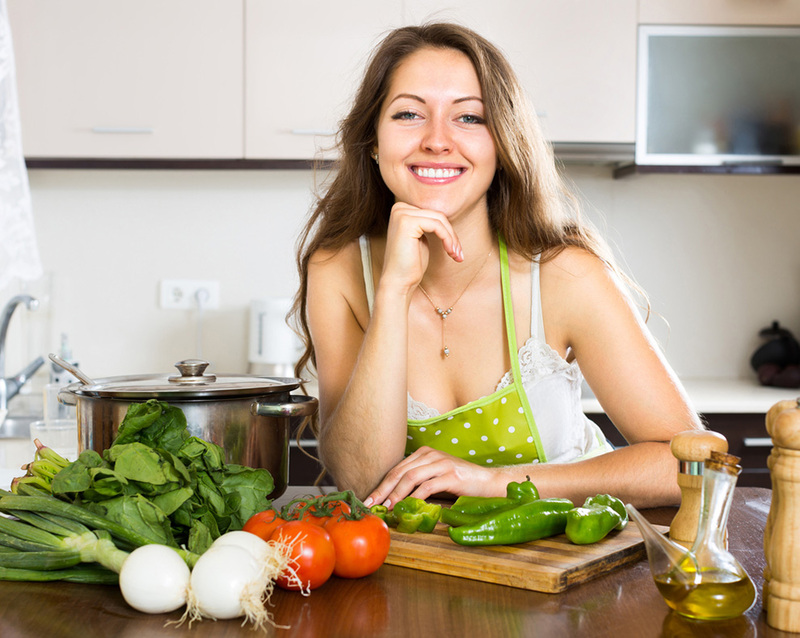 Now that you know more about utility knives, their uses and the kind of blades they have it’s safe to say you can make a good choice when you go out and buy yours. However, if you want to save some time and effort, keep reading! We’ve taken the liberty to review the best utility knives for you. This highly portable utility knife has been featured in several lists as a must-have utility knife, and it’s easy to see why. This flip utility knife features a magnetic blade storage, that folds into the body of the knife, allowing you to carry an extra blade for whenever needed, making changing a blade easy and hassle free. It has a sturdy metal body that not only feels good and solid on your hand but it’s also quite durable, which means you’ll get to use it for years while only changing the blades every now and then. 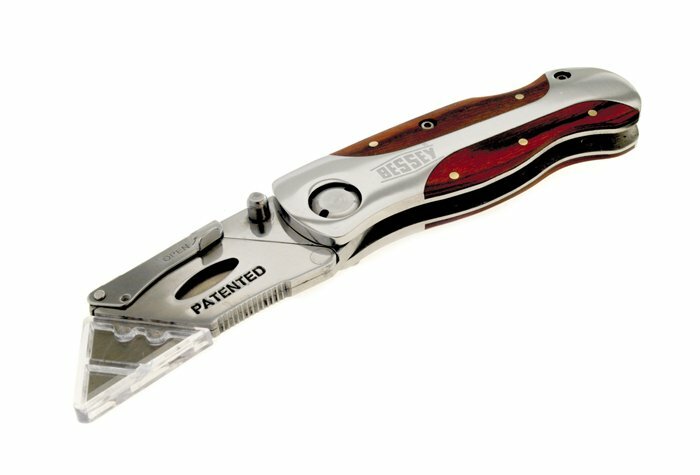 Another great characteristic of this utility knife is the integrated gut hook, which allows you to cut wires, lines and cables; and the integrated wire stripper, which makes this utility knife one of the most useful ones out there! To make things even better, this knife comes with an extra blade dispenser that includes 50 replacement blades! 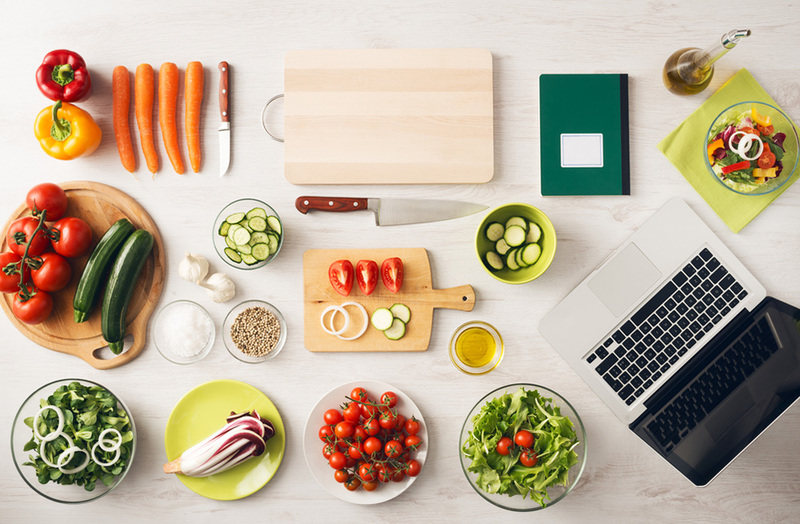 If what you’re looking for is practicality alongside convenience, then this is the knife for you. Its slick, utilitarian design might look a little too simple, compared to other utility knives, but this less-is-more approach comes with deep finger grooves, to ensure a firm grip and the simple design gives you resistance to rust, making this a very long lasting knife. This is a sturdy knife that, when folded, can fit very well in your pocket. Making it perfect for carrying it every day. It’ll cut through drywall, boxes, twine, rope and more! If that wasn’t enough, don’t worry about replacement. Standard utility blades work just fine so feel free to buy them in bulk. Stanley is a household name when it comes to tools and it’s easy to see why. This brand is quality and their 10-819 Fatmax Retractable Knife is evidence of that. This retractable knife is very lightweight, thanks to its aluminum housing, yet very sharp, making it perfect for those looking to use it frequently. The light weight, coupled with the extra-large handle, makes it a good option for those with mobility issues or weakness on the hands. That’s not all, the dial that moves the blade is quite large, making it easy to control the length of your blade and to replace it when needed. 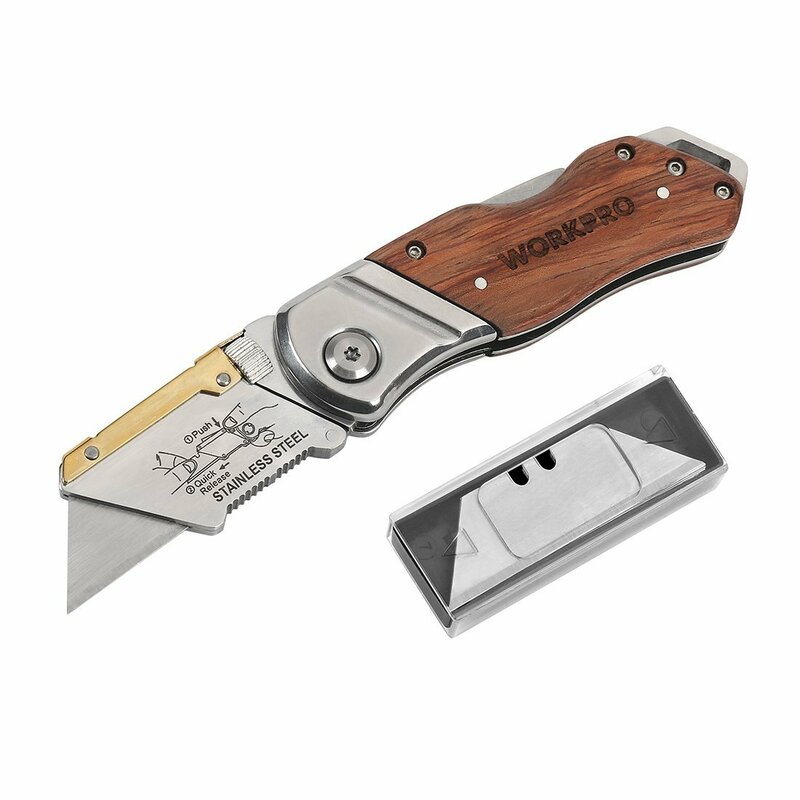 This amazing knife can carry up to 15 blades and comes with a magnetic nose that ensures the blades stay in place when being changed, a thoughtful safety measure that’s bound to minimize injuries. As you can imagine, this is one of the most expensive knives in this article but great quality does tend to come at a cost. Keep in mind that this is a rather large knife, measuring 10.1 x 3.8 x 1.2 inches so while it’s a great tool for those looking for a sturdy knife, it’s not for those who need a small, easy to carry utility blade. If the only reason you don’t carry a utility knife with you at all times is because it clashes with your style, don’t worry. This knife will change that. This knife looks great, works great and is quite durable, making it the to-go choice if you want a little of everything. What makes it so attractive? The fact that the handle is made with wood grain and is quite slender, which makes it easy to store as well as lightweight. While not a fastback blade by any means, this utility knife can be used one-handed which is a huge plus if you’re standing on a ladder or can’t use your other hand for any reason. 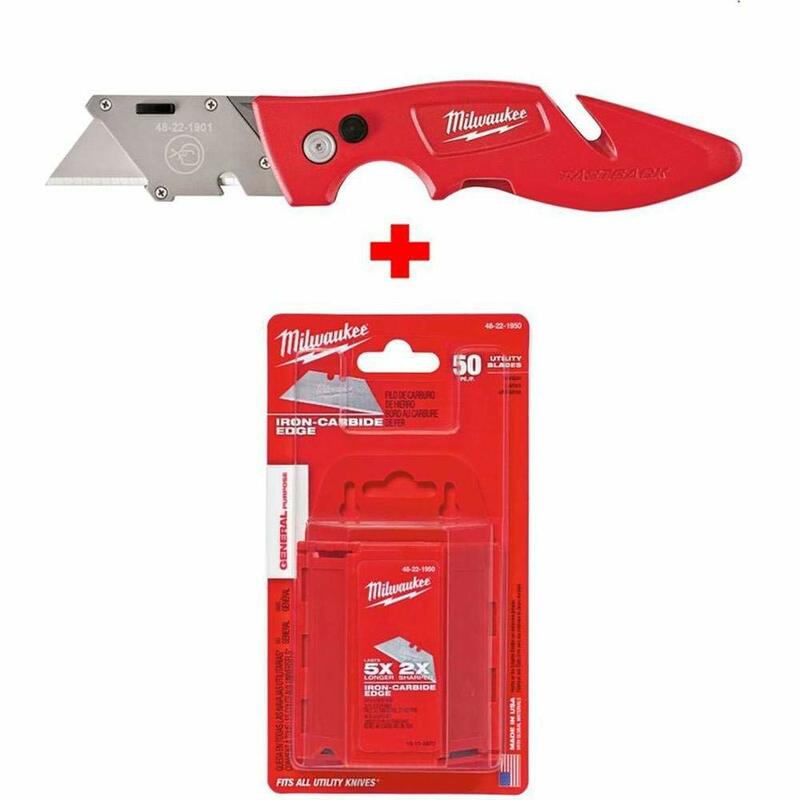 This knife accepts standard utility blades, so you won’t have to look through several stores to find a replacement and it’s quite light, making it easy to handle. If you’re looking for a sturdy and dependable utility knife that can do almost all its functions one-handed, this is the knife for you. With its ergonomic design, made with cast aluminum, and compact size, this is the perfect knife for performing all kinds of jobs, from cutting carpeting and drywall to slicing through cardboard and insulation plastic. 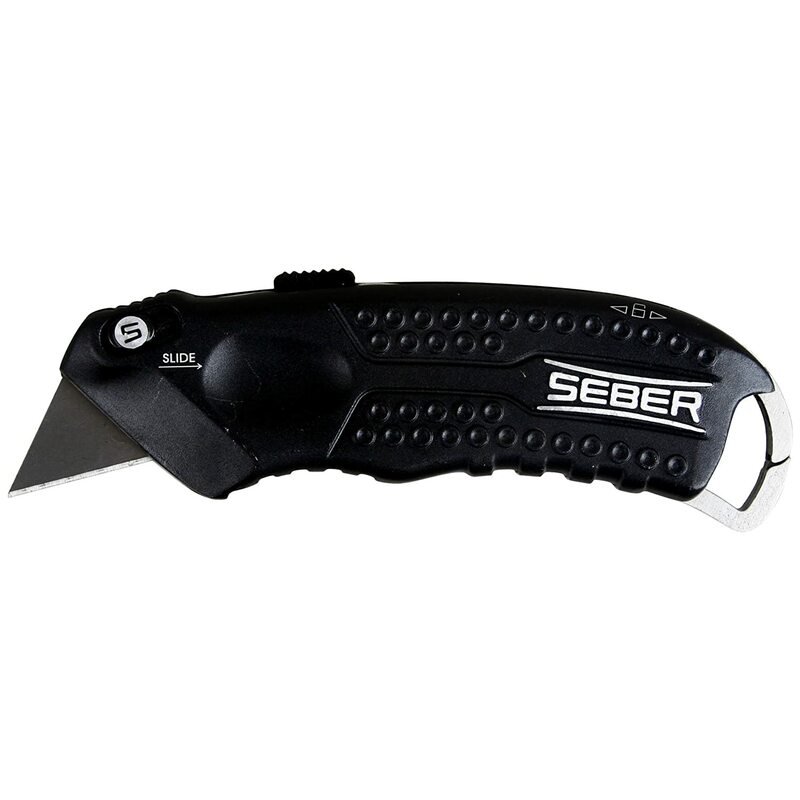 This knife is equipped with a smooth slide mechanism that gives you great control over the blade. Not only that but this knife also comes with a quick blade change button, which makes changing your blade, even one handed, an easy task. The knife only stores 5 blades, but it’s compatible with a wide variety of blades so that shouldn’t be a problem, unless you’re expecting to do a job that requires multiple changes of blades. The knife has a built in carabineer belt hook, so you can attach it to your belt loop and carry it around anywhere you go. Don’t worry about the blade accidentally releasing or any similar accidents. The blade will stay in the casing until it’s time to use it. What's The Best Utility Knife? Now that you know not only what to look for in an utility knife but also which ones are the best out there, you’re ready to go out and select your own. It looks badass! It feels very well built and will no doubt last a long time. What did you think of this review? Did you find the the best utility knife for you? Have you tried any of these sets before? Please let me know in the comments. I’d love to hear what you think.